The Soyuz MS-09 rocket is pictured standing at its launch pad on a clear blue day at the Baikonur Cosmodrome in Kazakhstan. 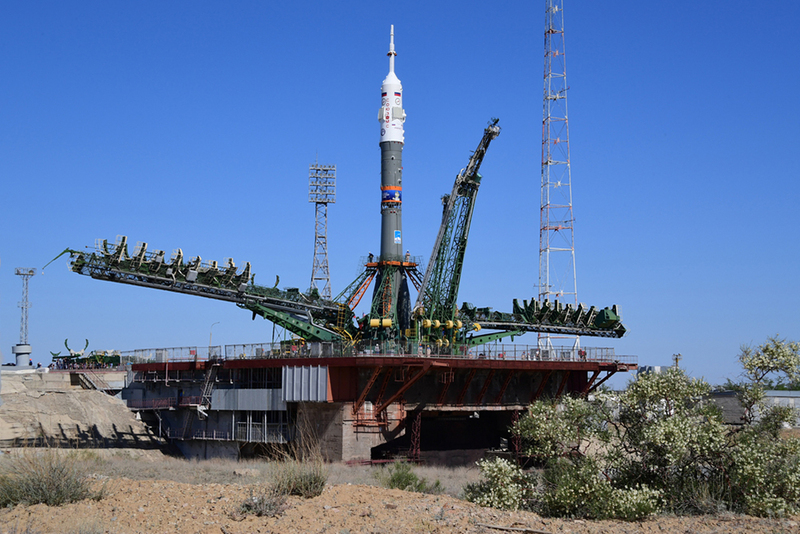 The Soyuz rocket that will launch three new Expedition 56-57 crew members to the International Space Station stands at its launch pad at the Baikonur Cosmodrome in Kazakhstan. Soyuz Commander Sergey Prokopyev and Flight Engineers Serena Auñón-Chancellor and Alexander Gerst are in quarantine today preparing to blast off Wednesday at 7:12 a.m. EDT on a two-day trip to the station. Live NASA TV coverage begins at 6:15 a.m. The trio representing Roscosmos, NASA and the European Space Agency will orbit Earth for two days before arriving at the station’s Rassvet module Friday at 9:07 a.m. The crew will enter its new home after the hatches open around 11:30 a.m. to begin a six-month mission aboard the orbital laboratory. NASA TV will begin its live docking coverage Friday starting at 8:15 a.m.
Three veteran station residents will greet the newcomers Wednesday when Expedition 56 grows to its full complement of six team members. Station Commander Drew Feustel and Flight Engineers Ricky Arnold and Oleg Artemyev have been living in space since March 21 and will help familiarize their new crewmates with station systems and safety procedures. Meanwhile, the three orbiting Expedition 56 crewmates managed to work on scientific gear and prepare for next week’s spacewalk. Feustel cleaned samples cartridges inside the Electro-Static Levitation Furnace as Arnold readied the Plant Habitat-01 for upcoming botany research. The duo also assembled and tested spacewalking gear ahead of a June 14 spacewalk to install wireless communications gear on the Harmony module.